Here’s what happened in last night’s game. Each PC gets 2,290 xp. Only the white dragon Glazhael stands between you and the end of the adventure…. Rosie casts disguise self to appear as Rezmir and opens the doors to the barracks. Meanwhile Gwastdyn has summoned eight pixies and ordered them to become invisible. Rosie orders the dragonwings resting inside to line up, telling them that intruders have been seen in the castle. The cultists fall for the deception and are standing together in a group when Turin casts shatter. This is followed by hunger of Hadar from Rosie and sleep, confusion, and entangle spells from the pixies. Turin and Ug attack the hapless cultists near the edge of the darkness while Crake waits outside and picks off ones escaping through the side doors with his bow. With the dragonwings dealt with, the PCs enter Rezmir’s chamber. Crake is attacked by a rug of smothering but manages to avoid being smothered. The rogue checks the chest carefully for traps, before opening it. Inside is the Black Dragon Mask and a large cache of gems, jewellery and coins. Deciding to report to Blagothkus, the party head up to the Upper Courtyard and go to the cloud giant’s tower. The ogres on the battlements tell them their boss has gone to the steering tower. The PCs walk over there but find it locked, and there is no answer at the door. They return to Rezmir’s room to rest for the night. 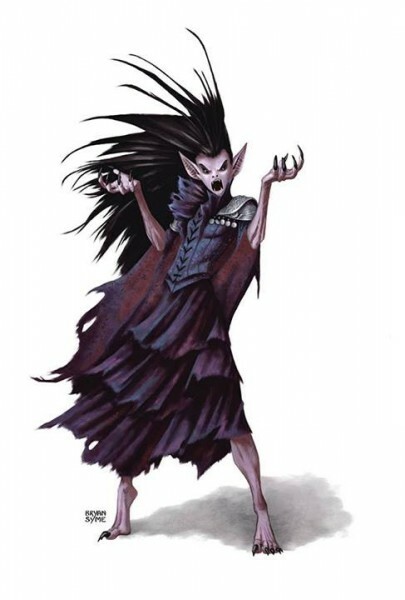 That night, while Gwastdyn is on watch, the vampire Sandesyl Morgia appears and attacks the dwarf. The others wake up and join in but are unable to stop the druid falling unconscious. Ug strikes her with his divine smite, inflicting radiant damage which stops her regenerating. The vampire flees into the courtyard and gives the party the slip. Shaken, they heal Gwastdyn, Rosie casts an alarm spell, and the PCs finish their long rest. The next morning the PCs explore the store room and the guest chambers, before returning to the Upper Courtyard. As they look at the horizon, they realise the castle has turned around and is now heading north. Deciding to explore the crumbling tower, Ug climbs up to the balcony 75 feet above. Unfortunately it’s not strong enough to bear his weight, and gives way when he climbs onto it, sending him plummeting to the ground. The others dodge out the way but Gwastdyn isn't quick enough and it struck by falling debris. Ug climbs back up and throws a rope down to Turin who joins him. The pair go through the door into the vampire’s lair and are attacked by two vampire spawn. Crake starts climbing up the tower, while Rosie casts dimension door to transport herself and Gwastdyn up to the top. The warlock is grabbed by one of the vampires and is bitten twice as Ug and Turin battle the other one. Crake arrives and takes down one of the spawn, but then the coffin opens and Sandesyl appears. Ug turns on her, destroying her with his divine smite. Then, Turin slays the final vampire spawn. The PCs take a short rest, then visit Blagothkus in his tower. The cloud giant tells them he is taking the castle to the Spine of the World but will gladly drop them off en route – at Waterdeep for example. He urges them to go and deal with the dragon. Exhausted after their battle with the vampires, the PCs return to the Lower Courtyard and have a long rest. "The cloud giant thinks about being useful for a minute & then lol nopes out." For some strange reason he wasn't very keen on fighting the dragon or sending his ogres along as cannon fodder!